The Amateur Traveler talks to Audrey Scott and Daniel Noll of UncorneredMarket.com about Prague where they lived for 5 years. Audrey and Daniel are currently traveling around the world and talked to me from El Salvador. Audrey and Daniel talk about the touristy things to do in Prague like the Prague castle, the Charles bridge and Wenceslas Square. They also talk about the touristy things that they would recommend skipping like Karlova street and its souvenir stands (they even give us a shortcut through the university and the Karolinum to avoid it). They would not; however, skip drinking Czech beer in a beer garden like the Latna (but would pass on Czech wine). They tell us how to walk around the barkers in period costumes selling packaged concerts to tourists and find the real music scene in Prague from classical to Balkan. 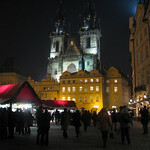 Since they have moved on you can’t crash on their couch but you can share in their expertise of how to cherish Prague. Q: You used to have themed episodes (how to take travel photos, bad hotels) but there haven’t been early since I started listening about a year ago. Any plans for themed episodes in the future? They make for a nice change of pace and can provide useful general tips. Q: Why are episodes 1-18 not in the archive? A: It makes the feed shorter… and they are not as good. They are available from the episode list on the web site. Q: My version of the Krakow episode came out at 2 minutes long so I had to resubscribe to the podcast to redownload it. Am I the only one who had this problem? A: Sadly you were not the only one. I had a problem with my hosting provider. The episode has been fixed. Try downloading it again. Great job as usual – and a discussion with some of my favourite people (hi Audrey! ).